Natural dry eye treatment may be the best treatment for dry eyes. What is the best treatment for dry eyes? This is a question that optometrists and ophthalmologists have been trying to figure out for years. A lot of money and research is used in developing a dry eye treatment that works. Everyone is looking for that magic potion or miracle dry eye treatment. Patients with dry eyes will try anything to get relief of their symptoms. Currently the traditional approach to dry eye treatment is to use artificial tears, oral and topical antibiotics, topical steroids and punctal plugs. Some newer dry eye treatments are Meibomian gland probing, IPL ( intense pulse light therapy), and Lipiflow. These newer treatments for dry eye are all aimed at unplugging the Meibomian glands to allow a healthier flow of the crucial outer lipid layer of the tear film. These treatments are not covered by insurances and are relatively expensive and not permanent. Sometimes the simplest and most natural approach is the best. I have been seeing dry eye patients in an extremely busy dry eye practice since 1992. I have been able to determine what works and what doesn’t work. I have taken all of my years of experience in clinical dry eye treatment and nutrition and formed a natural dry eye treatment plan that works quite well . 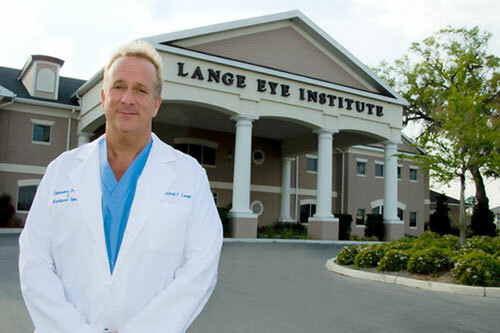 I have patients that travel 1000s of miles to come to The Lange Eye Institute in the Villages Florida to learn about natural eye care . We take a wellness approach to our patients at Lange Eye Care and help the patient to become pro active in their future health through dietary changes and lifestyle modifications. We use this wellness approach to complement our traditional medical and surgical care of our patients. Many patients come to Lange Eye Care for a second opinion because the traditional dry eye treatment was not working and they are seeking out a different approach. We have been able to help many patients that traditional dry eye treatments have failed through a more natural approach. 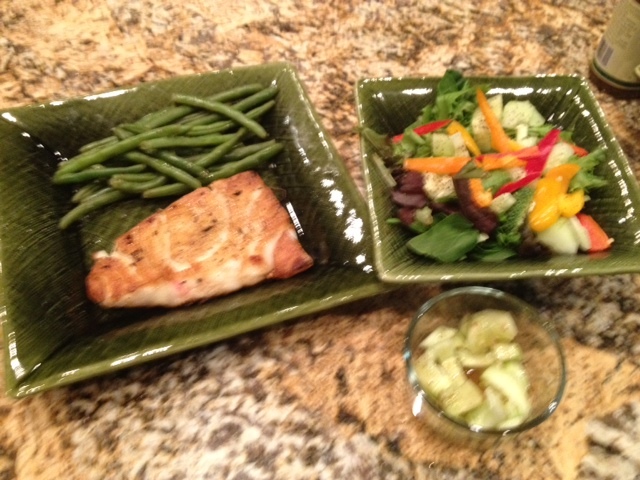 Wild Alaskan Salmon and plenty of vegetables ia a Paleo diet for dry eyes. Patients respond favorably to a natural dry eye treatment approach. First and foremost most patients will need a diet overhaul. The typical American with dry eye is consuming a pro inflammatory diet that is very high in omega 6 fatty acids. These patients will respond well by simply changing their diet to an anti inflammatory diet . I recommend a combination of the gluten-free, Paleo and mediterranean diets. Eating more fruits, vegetables, lean proteins, nuts and seeds and staying away from processed foods is the idea behind these diets. Simply by adjusting their diet many patients will report less dry eye symptoms and feel better and look better. Most patients with dry eyes are also dehydrated. They are not drinking enough good quality water and drinking too much coffee, sodas and alcohol. When we bump up their water consumption to half their body weight in ounces of good quality water and add a few glasses of coconut water many of the signs of dehydration will start to improve including dry eye symptoms. A small amount of coffee may actually be good for dry eyes. Some recent studies prove that small amounts of caffeine may stimulate the tear glands. I do still recommend one to two cups of coffee a day. I also recommend consuming green tea, white tea, almond milk and coconut milk throughout the day. When consuming large amounts of water drink only spring water or filtered well water. Stay away from reverse osmosis and distilled water due to the acid ph and the lack of minerals. Try to drink spring water out of a glass bottle however if you can’t find it in glass it is ok in plastic as long as it is kept at room temperature. Smoking lowers serum antioxidant levels in the blood and increases the risk of all eye problems including dry eyes. Smoking cessation is tops on the list to help improve dry eyes. Patients that are overweight are also more likely to have dry eyes ,cataracts, glaucoma and macular degeneration. Weight loss is also a step in the right direction of helping to eliminate the dry eye suffering many patients are plagued with. 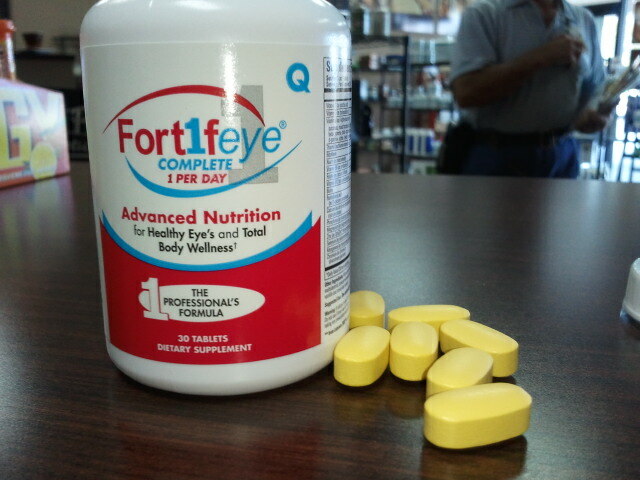 Fortifeye Super Omega is many doctors choice for dry eye. 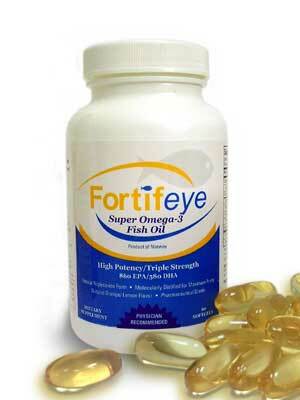 The number one supplement or vitamin for dry eye is Omega 3 fish oil. The typical fish oil that you purchase at the local drug store will not have a high enough concentration of omega 3 to be effective against dry eye. These typical store bought omega fish oils are made of an inferior oil called ethyl ester fish oil. Ethyl ester fish oil is an inexpensive way to purify and concentrate a fish oil however it makes the molecule very unstable and can therefore go rancid very easily. This is why many people burp up a nasty rotten fish smell. I recommend going with a triglyceride form omega fish oil with a minimal concentration of EPA 850-900 and DHA of 550-600 in two gel caps. Taking these levels of this type of fish oil will move the omega index to a truly healthy level over 9%. The omega index is the ratio of omega 3 to omega 6 in our blood. New studies suggest an omega index over 8% is the healthy zone. 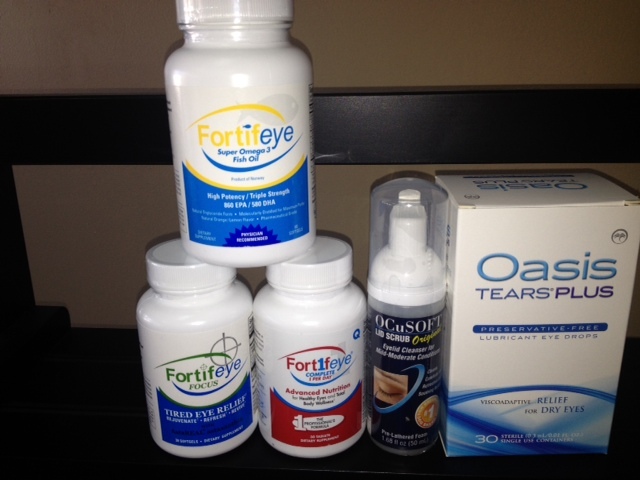 Fortifeye super omega is the fish oil I recommend since it full fills all of this criteria. Fortifeye Super Omega has an Epa of 860 and a DHA of 580 in two gel caps. An omega three study proved that two Fortifeye Super omega will bring the omega index on an average over 9.1 % and in many patients as high as 11%. This fish oil has a very good taste ad will not cause any burp back. It is in a gel cap that can be swallowed or is also made as a chewable capsule as well. 1000s of doctors and patients are experiencing the dry eye benefits from taking Fortifeye Super Omega. I recommend patients that have severely dry eyes or patients that weigh over 240 lbs to take three to four of the Fortifeye Super Omega on a daily basis. My second favorite supplement or vitamin for dry eye is a carotenoid called astaxanthin. Astaxanthin is a potent anti oxidant as well as a potent anti inflammatory. Astaxanthin has been shown in multiple studies to reduce eye strain and improve accommodative ability in near point tasks. Astaxanthin is also used by athletes to improve muscle endurance and muscle recovery. Many patients notice less wrinkles and fine lines in their face after taking astaxanthin for a few months. This potent carotenoid also has some sun blocking properties ultimately helping to protect the skin and eyes from the damaging suns rays. 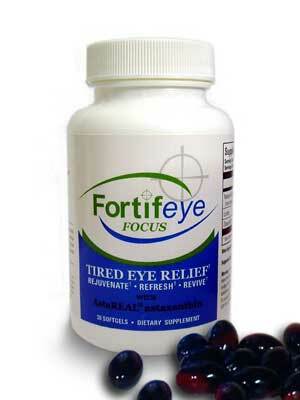 Fortifeye Focus is a supplement I developed using 6 mg of astaxanthin, 4 mg of lutein and 200 mcg of zeaxanthin. I have had incredible results with this product and patients with dry eyes. When combined with Fortifeye Super Omega the dry eye benefits are improved dramatically from either one used alone. Many of my patients are noticing dramatic improvement in dry eye and tired eye symptoms after taking both Super Omega and Focus for 1-2 months. Subjective and objective improvements are noted on these patients. Since many of these patients will fall short of eating the 10-13 servings of organically grown fruits and vegetables , I recommend taking a good multivitamin. I have developed a multivitamin called Fortifeye Complete One-per-day for this situation. It is important when dealing with dry eye patients to make sure they are not nutritionally deficient. A nutritional deficiency can be a cause of dry eyes. A Potassium deficiency can also be a cause of dry eye. This is another reason I recommend dry eye patients drinking a few glasses of coconut water a day . 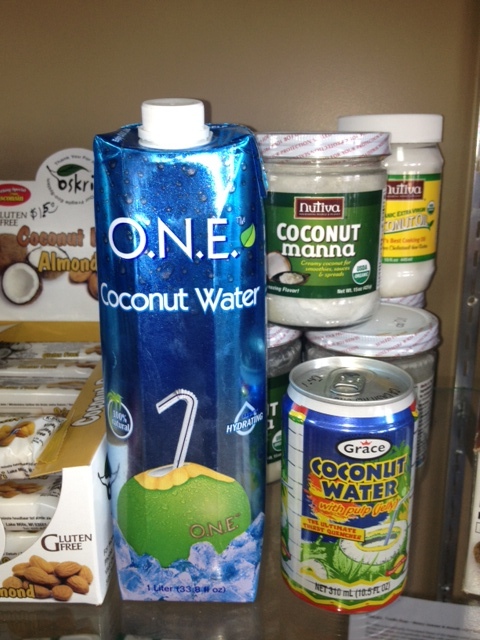 Coconut water is very high in potassium and is one of the best ways to hydrate . In summary, Dry eye is a chronic condition that wont go away over night. However if the suggestions made in this article are followed then the chances of your dry eye improving are significant. This article was for educational purposes only and never replaces a comprehensive eye exam from your local optometrist or ophthalmologist. I hope this has been informative! syndicated talk show host of “Ask the Dr.”. Dry Eye Treatment by Dr. Michael Lange Optometrist and Certified Nutrition Specialist site under construction.